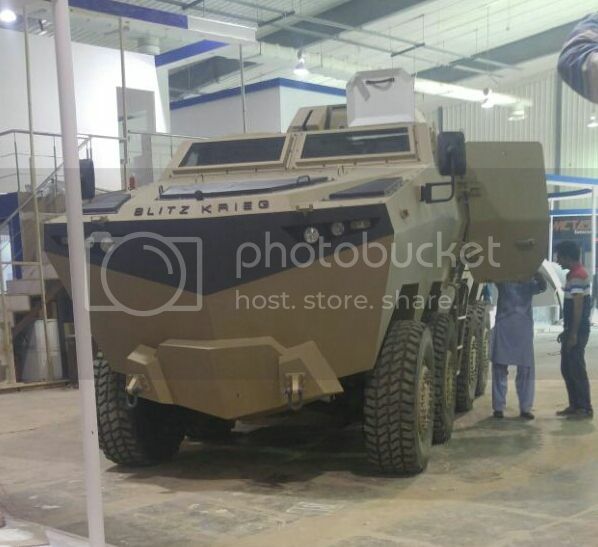 The privately-owned Pakistani company Blitzkrieg Defense Solutions - and yes, that is the actual name - has developed a new 8x8 wheeled vehicle. 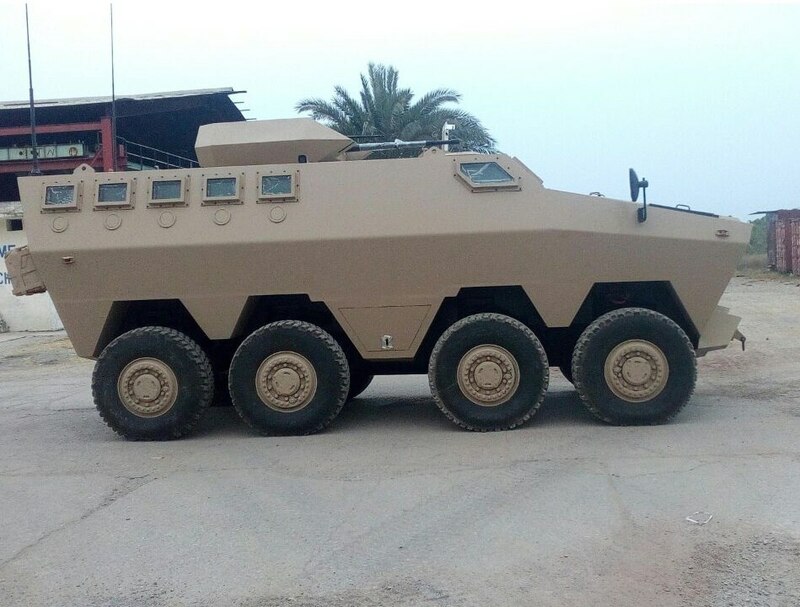 Supposedly it is the first 8x8 vehicle developed in Pakistan. 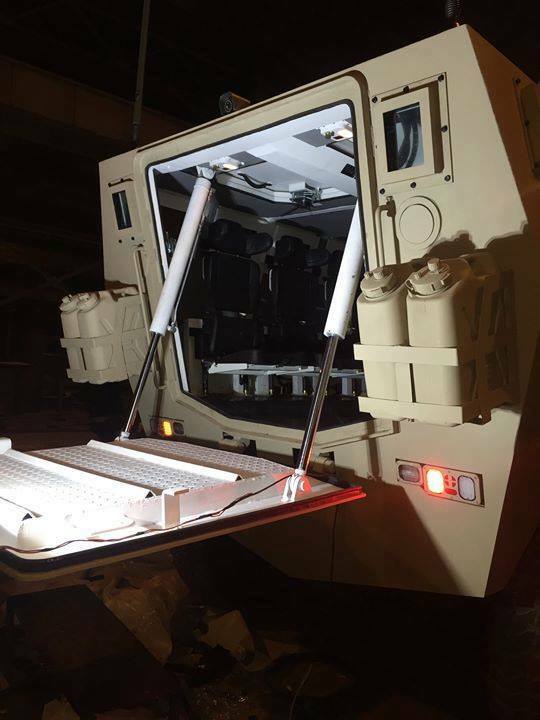 The new vehicle is known under the name "Hamza" and was officially presented at the International Defence Exhibition and Seminar (IDEAS) in 2016. It should not be confused with the Al-Hamza, a local version of the M113 fitted with a 25 mm gun in a one-man-turret. 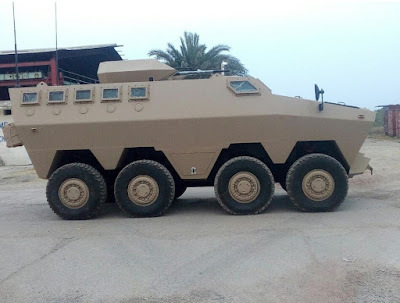 The Hamza is described as the world's first 8x8 mine-resistant ambush-protected (MRAP) vehicle or as hybrid between MRAP and armored personnel carrier (APC). Blitzkrieg Defense Solutions calls the vehicle a multi-role combat vehicle (MCV). In general all of these terms seem to be focused on marketing, as it is common for the heavier protected 8x8 APCs - such as the Patria AMV, the Artec Boxer and the ST Kinetics Terrex-3 - to feature a level of protection against mines and improvised explosive devices (IEDs) equal to or greater than a MRAP. The Hamza is a rather unique design. While featuring an upper superstructure like a conventional truck or MRAP with front-mounted engine, the shape of the rest of the hull is very similar to a 8x8 APC such as the PARS from FNSS. The superstructure however means that the internal layout is nearly identical to a large MRAP: instead of the driver sitting next to the engine in a small niche, the crew and all passengers are located in a single large compartment. The driver is located at the right of the vehicle, being located behind a large two-part windshield. One further window on each side of the vehicle front provide good vision along the frontal 180° arc. To the left of the driver another seat is located, either for the gunner or commander - most likely for the latter. This place includes a digital screen and input controls in front of the seat. Behind the driver a further forward facing seat is installed, probably for the gunner. The roof above the frontal two seats (for the driver and commander/gunner) includes two hatches. Two further hatches are located at the very rear of the vehicle. On the left and right sides of the superstructure, ten smaller windows (five per side) with firing ports below them are located. On current NATO and Russian combat vehicles, firing ports have been abandoned due to being a potential weakspot. 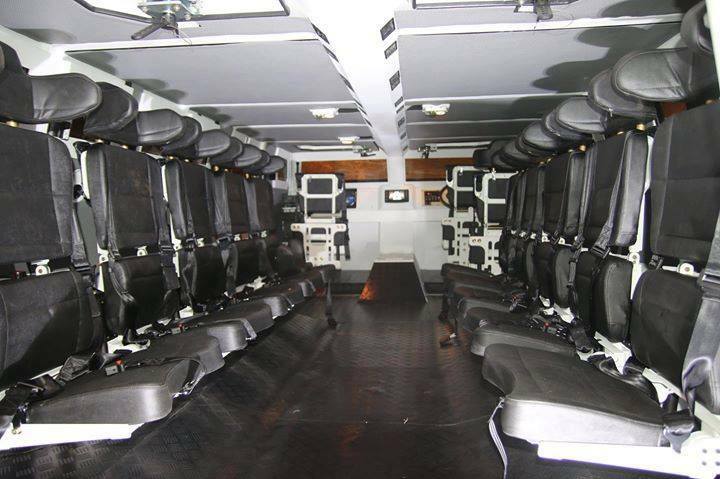 Inside the middle and rear section of the vehicle's superstructure two rows of each five seats are located, facing towards each other. In the presented configuration, the Hamza MPC has a crew of three, consisting of driver, gunner and commander, while providing seating for up to 10 dismounts. A hydraulic rear ramp allows the dismounts to enter and exit the vehicle, while a door at the left of the frontal section allows the driver, gunner and commander to enter the vehicle. 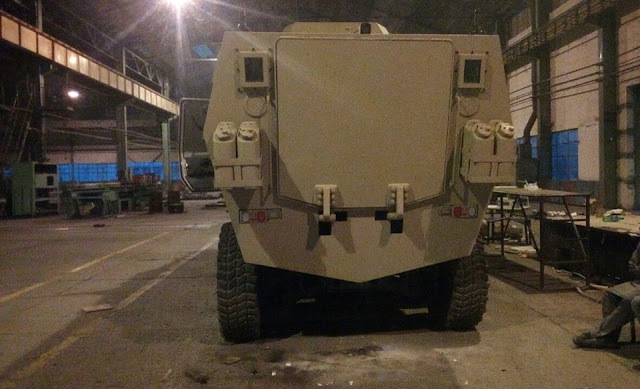 However the market material from Blitzkrieg Defense Solutions claims that the Hamza is capable to transport up to 14 people (including crew), probably in an APC configuration without dedicated gunner. The Hamza MCV vehicle seems to be one of the tallest wheeled vehilces currently on the market. The height of the Hamza seems to be above three metres (9.8 feet) when fitted with a low-profile unmanned turret. Without the turret, it should be taller than the average 8x8 wheeled APC (such as the Patria AMV, Boxer and Piranha) by half metre or more. The vehicle is powered by an engine of currently unknown type with an output of 600 horsepower. The tires are made by Goodyear, but they appear to be bit small in relation to the vehicle size. This might be the result of the Hamza being taller than other vehicles though. The exact weight of the vehicle is currently unknown. In an interview a spokesperson from the manufacturer claimed that each of the four axles can support a weight of up to 13 metric tons; hence the maximum possible weight could be close to fifty metric tons. However the marketing material from the IDEAS 2016 claims that the vehicle has a power-to-weight ratio of more than 20, which would limit the vehicle weight - given that it is powered by a 600 hp engine - to less than 30 metric tons. Even more confusing in this regard is the claim of a maximum payload of 15 metric tons - unless the base vehicle weighs less than 15 tons, which seems nearly impossible given the large size and relatively high level of protection while mounting a 600 hp engine - the power-to-weight ratio is not based on the gross vehicle weight, but rather on the actual weight of the presented configuration. This would mean the claim of the vehicle having a power-to-weight ratio greater than 20 hp/ton is a marketing lie, because once the Hamza carries some payload this won't be achieved. It must be noted however that the axles itself are not the only factor for determining the maximum gross vehicle weight of a wheeled combat vehicle. The tires and suspension also need to be capable of handling as much weight, which might explain the discrepancy between the claimed weight (less than 30 metric tons plus a maximum of 15 metric tons payload) and the ability of the axles to support nearly 50 metric tons of weight. The Hamza is claimed to be protected against ballistic and mine threats in accordance with the NATO standard STANAG 4569, supposedly meeting the requirements for level 4. In terms of ballistic protection this means the vehicle's armor is capable of stopping the 14.5 mm B32 armor-piercing round fired from a distance of 200 metres at all sides. While Blitzkrieg Defense's website currently is in a state of not being completed, the company (formerly known as Cavalier) is also offering bulletproof wests and body armor, making use of ceramic and aramid/kevlar layers. The Hamza is also claimed to utilize ceramic/kevlar composite armor, which seems likely, as other types of armor like IBD's MEXAS, AMAP-B and RUAG's SidePRO-KE/IED follow the same general layout: ceramic tiles with kevlar backing mounted ontop of the base armor. While not confirmed yet, it is understood that the Hamza is based on a steel construction, like most other 8x8 wheeled vehicles in the same weight class. However unlike most other modern combat vehicles, the Hamza has a smooth external surface. This means that the armor is either integrated into the steel structure or further layer of steel or another material is used as cover; on most current generation combat vehicles, the armor consists of external modules bolted on the vehicle's exterior - this allows easier replacement of damaged armor modules and simplifies upgrading the armor compared to the solution that seems to have been chosen for the Hamza's armor integration. The vehicle must be capable of surviving the detonation of 10 kilogram TNT below the hull for meeting the required level of mine protection for the level 4B of STANAG 4569. This is apparently achieved by using a v-shaped hull belly - a common design for cheaper vehicles, but a double v-hull as used on the late Stryker ICV or a composite armor anti-mine plating as used on the Patria AMV and the GTK Boxer could have provided similar protection while not affecting the vehicle's height as much as a single v-shaped hull. Composite mine protection kits also can reduce the weight by 20 to 30% compared to conventional designs using only the hull shape for deflecting the blast. The Hamza MCV presented at the IDEAS 2016 is fitted with a remotely controlled turret, which is armed with a 30 mm gun and a coaxial machine gun. The exact type of gun has not been disclosed yet. In general the turret of the Hamza prototype presented at IDEAS 2016 seems to be either a mock-up or a very early prototoype: it lacks any sort of proper optronics, has no smoke grenade dischargers and no sensors for providing the data required by the fire control system. Due to the large possible payload, the manufacturer claims that the Hamza also can accept turrets mounting 90 mm or even 105 mm rifled tank guns. 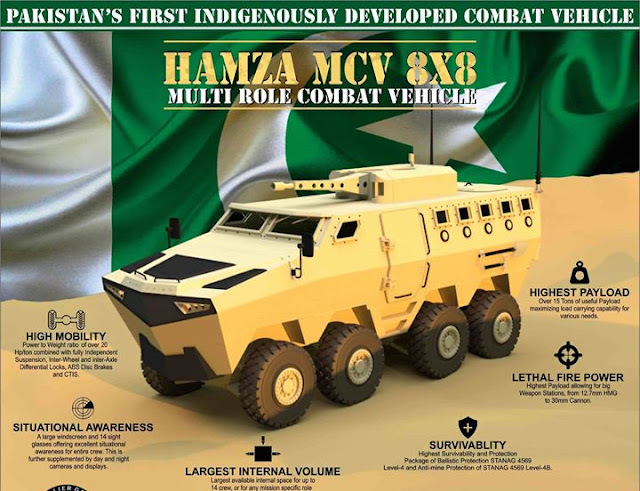 According to Quwa.org, the Hamza MCV might be aimed to satisfy two different requirements of the Pakistani Army: a requirement for a 8x8 wheeled vehicle as armored personnel carrier for rapid deployment of infantry was issued in 2014, while a separate requirement for a mine-resistant ambush-protected vehicle for counter-insurgency is also known since a few years. The Hamza might be capable of meeting both requirements as a single, locally made vehicle. This would be a major advantage by reducing costs and the logisitics. The Hamza MCV shows that the private industry - when given a proper motiviation - is capable of coming up with much better solutions than state-owned and corrupt organizations, which are unfortunately responsible for providing most armored vehicles to countries like in India and Pakistan. 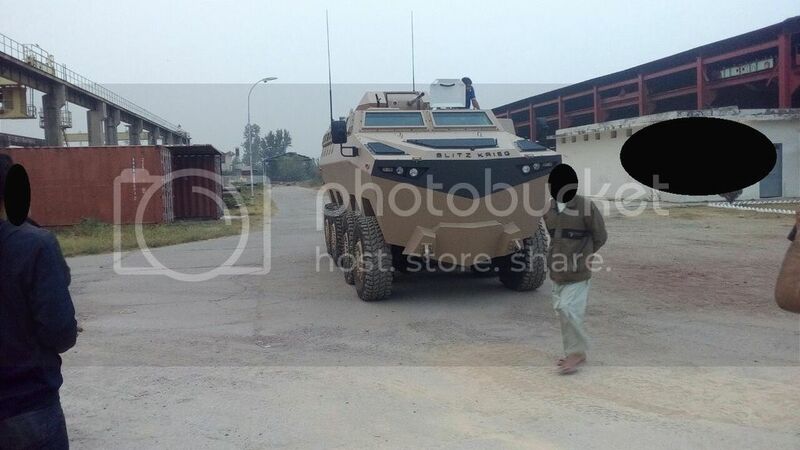 The Pakistani company HIT (Heavy Industries Taxila) for example mostly produces local copies of the M113 APC and licence-built Chinese export tanks that are not competitive against more modern designs. This is why conventional truck type designs are ill suited for 8x8 APCs and IFVs. The design of the driver and engine compartments and the placement of the turret will severely limit the ability to depress the main gun. The slopped front of most wheeled APCs and IFVs allows for maximum depression, which is not possible here. All sorts of bogus claims on this Hamza rolling bus. I would bet money there is no ceramic or composite armor on that hull besides maybe a spall liner. All picts on the net show a simple single skin metal hull considering metal thickness on the real ramp and no apliqe armoring i have doubts about level for armoring. What is with the firing ports all over if the infantry is seated facing in ?